Presented By: Nancy Altshuler, P.T. There are a wide variety of inserts that can be constructed for use in improving positioning and function. 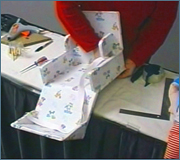 These include, hip guides, seat bottoms and seat backs, lateral trunk supports, and complete inserts for use in strollers or chairs. 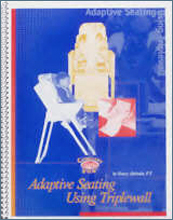 Triplewall can also be used to construct comer seats, sidelyers, prone standers, and other basic positioning devices. This program details the design, fabrication, and specific construction techniques required to make triplewall seat inserts. Several case studies are provided. 1. Describe the importance of positioning and the effects it has on a child's function. 2. Describe the basic knowledge of triplewall needed to design inexpensive adaptive inserts. 3. 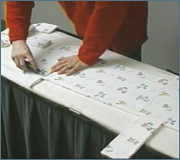 Describe how to measure a child, choose a type of insert and construct an insert with triplewall.